(JTA) – At least 59 gravestones were vandalized with swastikas and antisemitic epithets at the Hebrew Cemetery in Fall River, Massachusetts, according to police. The damage was first reported on Tuesday, March 19 and had occurred over the previous weekend. 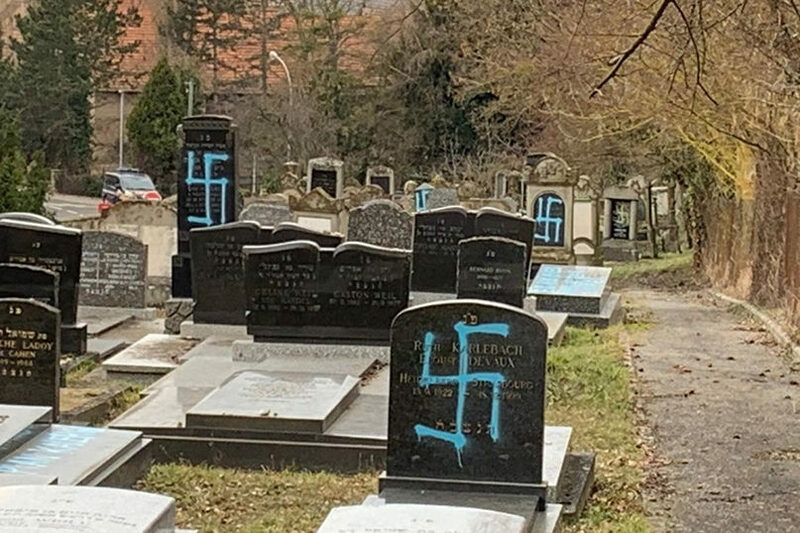 At the time it was reported that some 30 gravestones had been vandalized with swastikas and antisemitic epithets. But police later conducted a row-by-row inspection of the cemetery and discovered that some 59 gravestones had been drawn on and that two were knocked over. In addition to swastikas, the graffiti included “Heil Hitler,” “Hitler was right,” “Expel the Jew,” and “Oy vey, this is MAGA Country.” MAGA refers to the slogan from President Donald Trump’s 2016 presidential campaign standing for Make America Great Again. Police are investigating the incident as a hate crime.